On the basis of II Corinthians 5:17, what has happened to you? What are some of the evidences in your life of new things having come, and old things having passed away? To what does the Bible compare this experience of newness?. (John 3:3 ) Compare the experience of physical birth with spiritual birth. What are the similarities? According to Ephesians 2:8-9 , what did you do to merit this gift? Why is this important in our spiritual well-being? Colossians 1:13-14 speaks of two kingdoms. Describe the nature of each kingdom in relation to your life before and after you received Christ. What are you called? (I Peter 2:2) What should be your desire? How does the love of Christ motivate you? 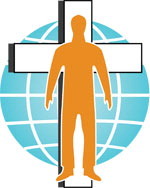 (II Corinthians 5:14-15) What has replaced self as the most important factor? What has happened to your old life, according to verse 3? What will motivate you to seek those things that are above, according to verse 1? What is the promise we are given in verse 4? How does it affect your motivation? How can you show you are a follower of Christ? (John 13:35) In what ways are you doing this in your everyday life? Read (II Corinthians 5:18-21 ). Describe the ministry that has been given to you. We are called, AMBASSADORS for Christ. In what ways are you fulfilling your call? As a follower of Christ, what is the greatest thing you can do? (Matthew 4:19) Name at least three ways you can do that in your own life. What is the greatest change you have seen in your life since you became a new creation in Christ? How will you change your goals as a result of your new motivation? What is your responsibility now to other men and women? How will you carry it out? List two changes you would like to see in your life now that you are a Christian. Ask God to bring about those changes. 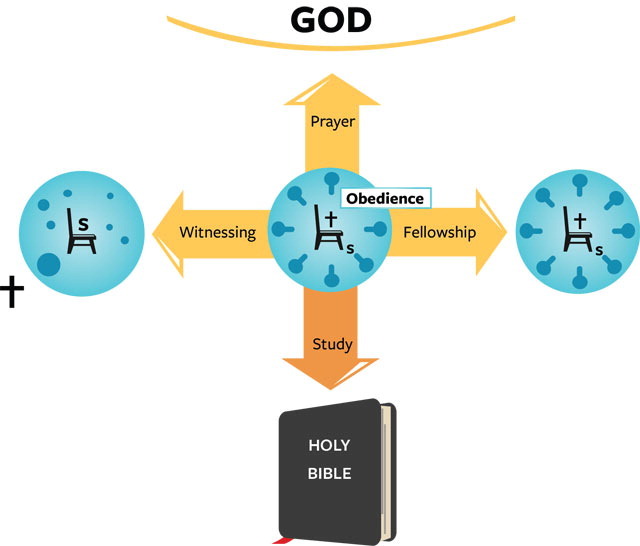 The two circles in the diagram below represent two kinds of lives: the self-directed life, and the Christ-directed life. The one on the left illustrates a life with self in control, and depicts a stressful, chaotic life. The circle on the right represents a life with Jesus Christ in controls, balanced and orderly, with a potential for rich, productive experiences. Which circle best represents you? Which circle would you like to have represent your life? Meditate on each question in this lesson as well as on the answer. Make this a personal appraisal of your spiritual condition. Types of Soil Read the parable of the sower in Matthew 13:1-23; Mark 4:3-20, and Luke 8:4-15. To what does the seed refer? (Mark 4:4) What are the four kinds of soil refered to in Matthew 13:4-8? What does each kind of soil represent? Compare Matthew 13:4;with verses 18 and 19.Compare verses 5 and 6 with 20 and 21.Compare verse 7 with 22. Compare verse 8 with 23. What type of soil do most of the professing Christians you know represent? What type of soil woud you say your life represents, and what kind do you want it to represent? How must the soil of your life be changed to become good ground or to increase its fruitfulness? List several problem areas that need changing. What must you trust Christ to do? What do you know happened when you became a Christian? According to verse 11, what must you do? According to verse 13, what is your responsibility? According to verse 16, man is a servant either of sin or righteousness. What determines his allegiance? Describe the benefits you have already seen from righteous living. Know that you have been crucified with Christ. Count yourself dead to sin and alive to Jesus Christ. What wrong attitudes are given in verse 11? Why is it necessary to consider verse 5 when you plan your future? How can you apply the instruction in verse 7? Be specific. What does verse 34 mean to you? Commit you way to the Lord. Alex was distressed over his constant failure to live the Christian life victoriously. “I’m always failing,” he said. “I know what is right, but I’m simply not able to keep the many commitments, resolutions, and rededications that I make to the Lord almost daily. What’s wrong with me? Why do I constantly fail? How can I push that magic button that will change my life and make me the kind of person God wants me to be, and the kind of person I want to be?” All of us experience this conflict when we walk in our own strength. But the victory is ours as we learn to abide in Christ. Jesus said, “I am the vine, you are the branches. He who abides in Me, and I in Him, bears much fruit; for without Me you can do nothing.” (John 15:5) The reality of abiding in Christ and Christ abiding in us is made possible through a supernatural enabling of the Holy Spirit. Abiding in Christ means to be one with Him by faith. It is to live in conscious dependence upon Him, recognizing that it is His life, His power, His wisdom, His strength, and His ability operating through us that enable us to live according to His will. We do this by surrendering the throne of our lives to Him, and by faith drawing upon His resources to live a supernatural, holy fruitful life. The abiding life, we in Christ, He in us, enables us to live a victorious and fruitful life. Millions of Christians throughout the world profess their love for Christ each week by attending church, singing songs, studying their Bibles, and attending prayer meetings. Yet, all the talk in the world will never convince anyone that you or I truly love the Lord unless we obey Him, and this includes bearing fruit for Him. The only way we can demonstrate that we are truly abiding in Him is to produce fruit, which involves introducing others to our Savior as well as living holy lives. The abiding life also brings lasting joy. “I have told you this,” Jesus said, “so that my joy may be in you and that your joy may be complete.” To live this joyful, abundant life, we must learn to live in Christ, constantly yielding total control of our lives to Him. Is the abiding presence of Jesus Christ a reality in your life? As an expression of your will, in prayer, surrender the throne of your life to Him, and by faith, invite Him to endow you with supernatural life and enable you to bear much fruit for His glory. The Abiding Life Abiding is the key to the Christian experience by which the divine attributes are transplanted into human soil, to the transforming of character and conduct. – Norman B. Harrison. In John 15:5, what did Jesus refer to Himself as? What is the relationship between Christ and you, as illustrated in this verse? Why does Jesus prune every branch that bears fruit? (John 15:2) Whar are some of the experiences you can identify as “pruning” in your life as a Christian? (See Hebrews 12:6 and Romans 5:3-5) Explain the results. List two necessary qualifications for effective prayer according to verse 7. Christ commands us to continue in His love. How great do you believe this love to be? (Verse 9) How are we to abide in Christ’s love? (Verse 10) How do you think the result promised in verse 11 will be revealed in your life today? Write briefly what you need to do to begin abiding in Christ more consistently. What do you think He will do as a result? How do you think that will affect your life? What characterizes a person who is not in fellowship with God? (James 1:8) Think back on your life. How has this verse characterized your life, and in what ways has this changed since you came to know Jesus Christ? Read Isaiah 59:2. What is the result of sin in one’s life? Do you think sin in your life has affected your relationship with God? How? When God brings to your attention the fact that something you have done is sin, you are to confess – say the same thing God says about that specific sin. Do not just say, “I have sinned,” but state what the sin was and agree with God, looking at it from His viewpoint. Then determine to put it out of your life and not do to it again. What two things did the Psalmist do about his sin in Psalm 32:5? Also, what is the result of not admitting sin, or admitting it? In what situations has each of these results been true in your life? When we confess our sins, God restores us to fellowship. Walking in fellowship with the Father and the Son is referred to as “walking in the light.” Read I John 1:7 and list two results promised. Then give an example how you have experienced each in your life. When we are in fellowship with God, specific things are happening within us. According to Philippians 2:13 and 4:13, what are they? Describe how these verses can help you overcome specific temptation or weaknesses you face. What is this power within us that what is its result? (Romans 8:9 and Galatians 5:22-23) List several ways the qualities found in the Galatians passage are at work in your life. What should be our attitude when tempted? (Romans 6:4-11) Why? (Colossians 3:3) Identify ways you can obey the instructions given in the Romans passage. In your own words, write down what you will do when you find anything that breaks your fellowship with the Lord. Summarize the reasons it is so important to confess sin as soon as you are aware of it. Ask the Holy Spirit to reveal the sins in your life. Write I John 1:9 across the sins. Thank God for His complete forgiveness. Destroy the paper to signify what happened to your sins. Confess all known sin in your life. Sin is the result of disobedience, and it gives Satan a stronghold in our lives. Be filled with the Spirit. You are filled with the Spirit in the same way you became a Christian — by faith. Study God’s holy, inspired Word daily. Prayerfully apply its truths to your life. Live by faith. Everything you receive from God, from the moment of your spiritual birth until you die, is by faith. It is impossible to please God without faith. (Hebrews 11:6)Christ died to win victory over all the guerrillas in our lives. I encourage you to begin applying these principles to your life today, and He will help you be strong in Him. We are on the Battlefield Describe in your own word the picture depicted in Paul’s command given in Ephesians 6:10-18. What two things will putting on the whole armor of God help you to do? (Verses 10 & 11) How are we to defend ourselves against our enemies? (Verses 10-13). How does Romans 8:31 affect your attitude toward adversity and temptation? How do these principles help you live a more abundant life? Describe a specific situation in your life right now in which you need to employ a spiritual weapon. Which weapons will you use and how? Your son has just been rushed into the emergency room at the hospital. He was severly injured in a traffic accident, and is not expected to live… You’ve just discovered that your teenage daughter is pregnant… The house payment is past due; the dentist is threatening to turn your bill over to collection. Your telephone has been shut off, and you’re facing a layoff at work… Your husband is a hopeless alcoholic. He becomes violent when he is drunk… Crisis is part of life. We cannot escape difficulty. Jesus said, “In this world you will have trouble.” (John 16:33) In short, life is a battleground. But it is not the crisis that creates the problem; it is how we react to it. The pain of trouble can be eased by the attitude we take toward it. When two Christians face the same tragedy, one may become depressed and defeated while the other draws closer to God. What do you think is the reason for this? Some Christians believe that God has let them down when they find themselves without money, health, or prestige, or in severe straits. Such an attitude leads to coldness of heart, prayerlessness, distrust, worry, and selfish living. In this study you will learn about unrecognized blessings and how attitude makes the difference between a defeated outlook and a victorious one. God’s People in Trouble In Exodus 14:1-4, the Israelites experienced an unrecognized blessing. As you read, notice the human viewpoint of the people and God’s viewpoint as seen in Moses. Think back to a crisis in your life. How did those around you respond? How did you react? How could you have improved your attitude? List ways God has worked through difficulties in your life, and shown these difficulties to really be blessings. How can the Bible’s guarantee in Romans 8:28 be true that everything work out good for those who love God? What is the purpose of unrecognized blessings according to II Corinthians 1:3-4, and Hebrews 12:5-11? Read I Thessalonians 5:18 and Hebrews 13:15. What response does God command in all situations? How can you rejoice and give thanks when sorrow and tragedy come? Contrast this with the attitude of the Israelites in Exodus 14:1-12. With what trial in your life do you need to trust God right now? What do you think the unrecognized blessing in that trial could be? How can you receive those blessings? The following questions will help you review this Step. If necessary, reread the appropriate lessons from your saved or printed documents. In your own words, what does the abundant Christian life involve? Envision and describe the abundant life you desire for yourself. What part does bearing fruit have? What part does spiritual warfare play? How do you know your picture of the abundant life is consistent with God’s views? Life Application What specific steps do you still need to take to make the abundant life a reality for you? List verses from Lesson 6 that can help you deal with temptations you face. Each week, update your list to include additional temptations and the verses to help you deal with them. Adapted from The 10 Basic Steps Toward Christian Maturity, by Bill Bright, co-founder of Campus Crusade for Christ. © Campus Crusade for Christ. All rights reserved.